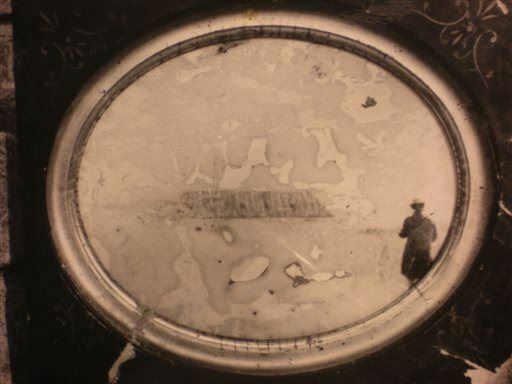 SAVANNAH, Ga. – For three decades, the stained and blurry photograph presented a great mystery to Civil War historians. It was a picture taken of another photo, which appeared far older and was encased in a peeling, gilded frame. In the foreground of that photo stood a man, his back to the camera, wearing an overcoat and a hat and carrying a pole or fishing rod. In the center, visible amid the stains and apparent water damage, was a ship. Did this picture show the only known photograph of the ironclad Confederate warship the CSS Georgia? The 120-foot ship armored with strips of railroad iron never had a chance to earn much glory in the Civil War. Its engines proved too weak to propel its 1,200-ton frame against the Savannah River’s currents, so the Georgia remained anchored off Old Fort Jackson as a floating gun battery. Confederate sailors sunk their ship in December 1864 as Gen. William T. Sherman’s Union troops captured Savannah. The CSS Georgia had never fired a shot in combat. Several artists of the period published illustrations of the Georgia, but the details varied and no blueprints survived. But there was that photo. It seemed to show a ship with the Georgia’s design: an armored casemate covering the entire deck, sides sloped at 45-degree angles. Though it was never authenticated, the photo became an unofficial part of the ship’s history. As the Army Corps of Engineers embarked this year on a $14 million project to raise the Georgia’s wreckage from the river, archaeologists publicized the image online and in news stories — including an Associated Press story — hoping to track down the original photo. “Wanted: A Photo Of This Confederate Battleship,” read the headline above the image on the Army Corps website. Robert Holcombe, former curator of the National Civil War Naval Museum in Columbus, Georgia, told the AP in February that while the original photograph would be needed to confirm if the image was authentic, he believed it was real. Now, the man who took that photo of the photo all those years ago, says he wants to clear the record: It is a fake. The Savannah native was at a yard sale when he found the photograph in an antique frame. Inscribed on the back of the frame was “CSS Georgia.” He didn’t have the $175 the owner wanted, so he took a photo of it and mailed it to historical groups in Savannah. When he was a teenager in Savannah, Potter, his brother Jeffrey and a friend shot a short 8mm movie about the building — and destruction — of the CSS Georgia in a fictional battle with Union troops. For the movie, they built an 18-foot long boat of plywood and Styrofoam, as well as a smaller 2-foot model. They based the design, in part, on his grandfather’s recollections of details passed down by word of mouth through generations of their family. Potter also used an illustration of the ironclad he found on a postcard. At some point, Potter decided to test whether he had the skills to pursue his dream of becoming a Hollywood special effects artist. Potter’s younger brother put on a coat and straw hat went out to a marsh with a cane fishing pole and Potter took a photo. He took another photo of the 2-foot model. He cut out the boat’s image, glued it onto the photo of his brother, then used dirt and Elmer’s glue to create the illusion of a photo faded by age and stained by water or chemicals. He bought an old picture frame and beat it up even further. He put the photo in it. Then he drove 120 miles to a yard sale — or maybe it was a flea market — in Waycross, Georgia, put the picture down and took a Polaroid of it. He laughs now, when he remembers that it had seemed so important that he actually do this at a yard sale, so at least that part would be true. “Who knows what goes through the mind of a kid,” he said. Potter sent out the photo to historical groups, setting off the sporadic, and fruitless, search for a CSS Georgia photo that he now says never existed. The peeling gilt frame that once held the disputed photo, is now filled with a portrait of Potter’s deceased pug, Puggy Van Dug. Potter, 50, lives alone, in a cluttered, one-story house off a secluded road of rundown and abandoned homes in Lenoir, a former furniture mecca in North Carolina. He never married, never had kids. When a reporter showed up at his door, he remarked it was first visitor he’d had in years. He never became a successful special effects artist. After high school, he moved to California and landed a job with a movie studio, but he returned to Savannah a year later to be with a girlfriend, he says. Potter opened an antiques store and began providing props for movies filming in the area. Later on, he set up his own special effects shop, and says he worked on a sequel to the movie “Swamp Thing” — which was filmed in Savannah — though his name doesn’t appear in the credits. A green piece of the movie’s monster costume is among memorabilia filling his home. Potter eventually drifted between jobs, including a stint as a maintenance man for the Tybee Island Light Station and Museum. He lived in a trailer behind the lighthouse. He spent many a night quenching his thirst for Pabst Blue Ribbon at Huc-a-Poos, where he left a lasting mark. After their father died in 2011, Potter and his brother moved to the North Carolina mountains. Then, last month, his brother Jeffrey, the only person who shared the secret of the photograph’s true history, killed himself at age 48. His death was confirmed by police records in Lenoir. Potter returned to Savannah with his brother’s ashes a week later, planning to scatter them off the beach of neighboring Tybee Island. A memorial and potluck with friends was arranged by Thomas, Huc-a-Poos’ owner. Thomas said Potter told him he only had $40, so the bar owner reached out to Potter’s friends at the bar to raise enough money for his brother’s cremation. Potter said he’d completely forgotten about the photo and had no idea the fuss it had caused until he saw it a few months ago on the Army Corps website. Then he had a choice: play along, or come clean. He decided to play along — for a few weeks. But after his brother’s death, he reconsidered, and reached out to AP to reveal the hoax, he said. “I’m not in good health. I didn’t want to drop dead and carry that to my grave,” he told AP. Potter said he never made any money off his hoax and never could have tried to sell the original photo he had made. “If you ever opened it, you would see it was printed on paper that said Kodak,” he says. And he’s a little taken aback that people took him so seriously. Todd Groce, president of the Georgia Historical Society, said Potter’s photo will remain in the group’s archives along with updated information that it appears to be a hoax. “It just shows you to question everything,” Groce said. But is Potter now telling the truth? As proof to back up his new story, Potter presented AP the 8 mm movie he and his brother had made. He showed old photos. One showed a young man he said was his brother, standing in a marsh wearing a coat and straw hat and carrying a cane fishing pole — much like the figure in the ironclad photograph. Another showed the same boy carefully holding, atop his fingertips, the small model of the ship, which looks identical to the ghostly image in the photograph. Another showed a pug lying next to a model of the ship. A fourth showed the long elusive photo in its frame on a quilt, next to a K-Mart bag, a bunch of Polaroids of the photo, the model of the ship and a Mad magazine from 1984. He also showed AP the picture frame, which he still has. As for the photo that was in the frame, Potter says because he used glue to “age” it, it was stuck to the frame. So it got shredded long ago when he removed it. After his brother’s death, Potter told Thomas about the hoax. Yet the bar owner suspects the ironclad photo may be real and Potter has it. Thomas said Potter had been drinking and he didn’t push him. And several times, Potter himself seemed to suggest to the AP that maybe he was pulling some sort of elaborate double hoax. But he dismissed that theory as “too wacky” to imagine. APPAMATTOX, Va. — Soldiers fought in Virginia last week, though without real ammunition in their guns. 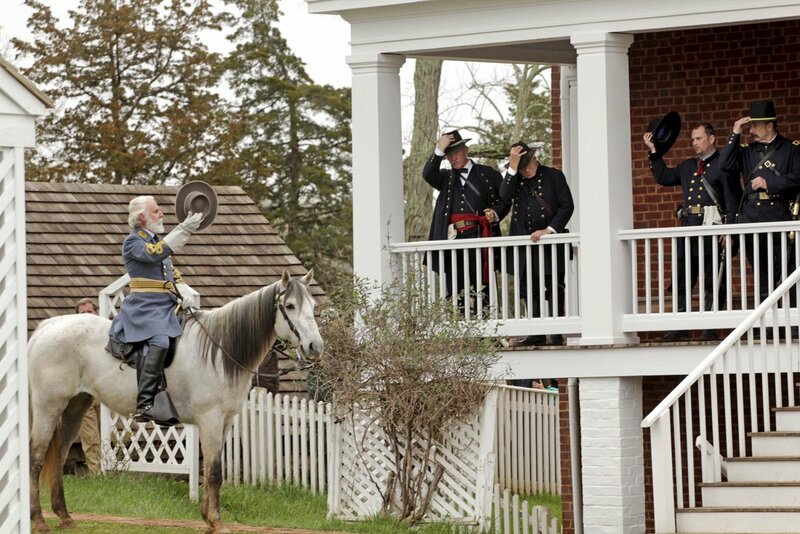 To mark the final chapter in four years of 150th anniversaries, this time the skirmishes at Appomattox Court House and the surrender of Confederate forces that followed, Civil War re-enactors donned historically accurate uniforms, mounted horses and slept overnight in 1865-style tents. Rifles set off a haze of smoke, though specialists from the National Park Service made sure that the gunpowder was used safely. For reenactors who consider themselves “authentic campaigners”—men and women who take their roles as reenactors very seriously—the events of April 9 were not just historically significant, but the ultimate display of reenactor pride: There were horses. There were mud-sullied uniforms embroidered just so. There were cannons and there were battle-worn flags. Reenactors also had to keep cell phones away from view, drink only out of old-school containers, and cook and eat only with utensils appropriate for the Civil War period. After the battle, participants recreated the moment that Ulysses S. Grant and Robert E. Lee signed an armistice after four exhausting, heart-rending years at war. Lee, realizing his army was “famished, exhausted and surrounded,” told a lone Confederate horseman to wave a white towel as a flag of truce. The Union army, led by General Grant, would accept nothing short of a full surrender, and eventually the fighting stopped, despite a few remaining skirmishes before news of the end of the war made its way through the nation. See above for one spectator’s fascinating photos of the reenactors’ battle. And for more about the sesquicentennial of the end of the Civil War, see Smithsonian.com’s guide to the war’s secrets, poetry and legacy, or our list of underappreciated and forgotten Civil War sites. RALEIGH, N.C. — History lovers gathered Monday at the State Capitol to commemorate how, exactly 150 years ago, the city surrendered to Union forces during the closing days of the Civil War. On April 13, 1865, state leaders gave up Raleigh without a fight in hopes of sparing the people and their property any damage or bloodshed. The city’s peaceful occupation helped shape Raleigh as it exists today, sparing it the destruction that occurred in some other Confederate state capitols in the path of Union Gen. William T. Sherman’s forces. 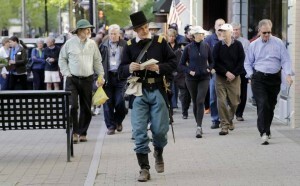 “History is never really boring,” said Bill Dantini, 61, an amateur historian and author in Raleigh, who was among 50 people who took part in a walking tour Monday morning along Fayetteville Street and the State Capitol grounds. In addition to the walk, an afternoon reception at the Executive Mansion will also mark the anniversary of Raleigh’s surrender. On Monday afternoon, Ira David Wood III will portray Sherman at an event sponsored by the N.C. Civil War History Center. But on Monday morning, Ernest Dollar, the director of the City of Raleigh Museum, took the walking tour back in time to when Sherman was pursuing Confederate Gen. Joseph E. Johnston’s army after the Battle of Bentonville in Johnston County in March 1865. By April 13, Confederate hopes of linking Johnston’s army with Gen. Robert E. Lee’s forces had been shattered by Lee’s surrender at Appomattox, Va. But between Appomattox and Bennett Place, Gov. Zebulon Vance sent a peace delegation to Sherman’s forces to save Raleigh. Other Confederate capitols, such as Columbia, S.C., and Milledgeville, Ga., had been heavily damaged. 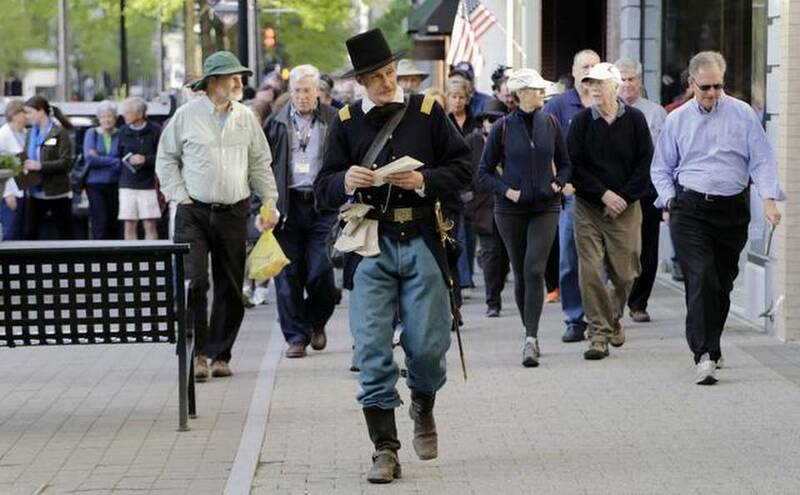 “One hundred and fifty years ago, there was great fear in Raleigh of what would happen,” said Dollar, who led the walking tour dressed as a Union Army major. The surrender spared Raleigh, but the city again faced destruction a few days later, when upset Union soldiers learned about the assassination of President Abraham Lincoln. It took Union Gen. John Logan’s threat to fire cannons on his own men to disperse the soldiers. While the April 13 surrender was relatively peaceful, it sparked at least one story that still exists in Raleigh’s folklore. A Lt. Walsh, a Confederate cavalryman who may have been looting a jewelry store on Fayetteville Street at the time, Dollar said, fired on Union cavalry advancing into Raleigh. Walsh was captured by Union forces and hung for violating the surrender terms. Every year since 1989, a sash is mysteriously placed on Walsh’s grave at Oakwood Cemetery, as he’s commemorated by some as a brave Confederate defender. But Dollar also told of the alternate portrayal, given by a slave who said Walsh was laughing maniacally as he was taken to the gallows. The events in North Carolina during the end of the war deserve to be remembered, Dollar said.